Mumia Abu-Jamal is an Innocent Man! For Labor Action to Free Mumia! On Monday, July 14th, the Alameda Labor Council passed the following resolution in response to the banning of “Urban Dreams” by the Oakland Unified School District (OUSD). The “Urban Dreams” website includes course material about Mumia Abu-Jamal which was used in the teach-in for Mumia in Oakland in 1999, comparing Mumia to Martin Luther King, Jr. Because of this, the Fraternal Order of Police attacked the website last April on Fox News, and OUSD administrators immediately and unilaterally took the website down. This public intimidation campaign comes right after the FOP blocked Debo Adegbele from serving as the Assistant Attorney General for the Department of Justice. Adegbele was involved in defending Mumia while working at the NAACP Legal Defense and Education fund. The FOP whipped up Democratic and Republican support to block his nomination. The FOP believes that, as an outspoken critic of the corruption and racism of the American legal system and both parties of American capitalism, Mumia must be silenced. In additional to legal and media pressure, they have in the past also utilized threats and actual physical violence against Mumia and his supporters. We demand that the Urban Dreams website be reinstated on OUSD’s website. Be it resolved that the Alameda Labor Council condemns OUSD’s censorship of the Urban Dreams website and demands that it immediately restore access to all materials on the website, reaffirms its demand for justice for Mumia Abu Jamal, and issues a press release to seek the widest possible support from defenders of free speech and those who seek justice for Mumia. This entry was posted in Free Speech and Mumia, Labor for Mumia, Recent News on July 25, 2014 by admin. Labor’s Fight : Free Mumia! April 24, 1999 West Coast Port Shutdown for Mumia's Freedom. Learn more about the history of working class Mumia defense. 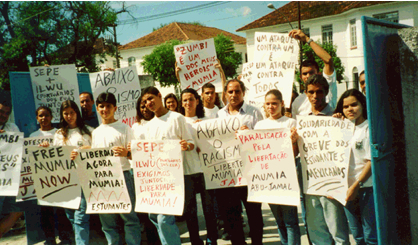 Students at Ernesto Faria School, Rio de Janeiro, participate in a teacher's union work stoppage for Mumia. Click for more ideas. 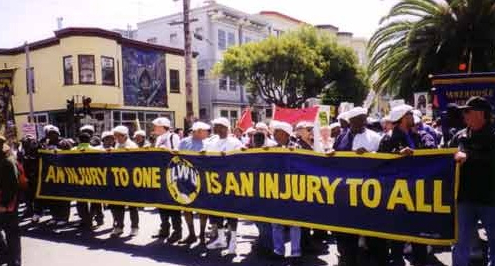 The Labor Action Committee to Free Mumia Abu-Jamal is a group of union activists dedicated to educating workers about Jamal's case and promoting labor action in solidarity with his struggle. Our founding statement dated January 10, 1999, is posted here.